The Country House Die - usually so traditional and proper - becomes a spooky mansion when used with the yellow and black Blackbird 6x6 print. Sections of the door and shutters swing open, offering a glimpse of the background, also from the Blackbird set. The 31st is coming up quickly - and it's a great time to use your Memory Box prints and dies to make a few quick cards like this one. View the dies and papers here. 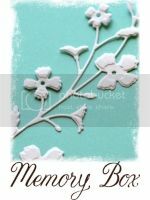 I'll share a few more ideas for them here - and on the Poppystamps Blog - then switch over to some Thanksgiving-ish designs for November.